We cook a fifteen pound bird for Thanksgiving dinner, and since we were only feeding five people, we had some a lot of leftovers. On Saturday night, we made Mexican turkey soup, a modified Ina Garten–better known as the Barefoot Contessa–recipe. It was the perfect recipe for our leftovers because we got to use up the rest of the turkey and the leftover celery and carrots from the dressing. original recipe here, or it can be found in Barefoot Contessa At Home. In a Dutch oven, cook your carrots and celery in the olive oil for about 10 minutes, then add the garlic and cook for another 30 seconds. (Please don’t burn the garlic.) Then add the stock, the can of tomatoes, cumin, coriander, cilantro and leftover turkey. Bring everything to a boil, then cover and simmer for 25 minutes. 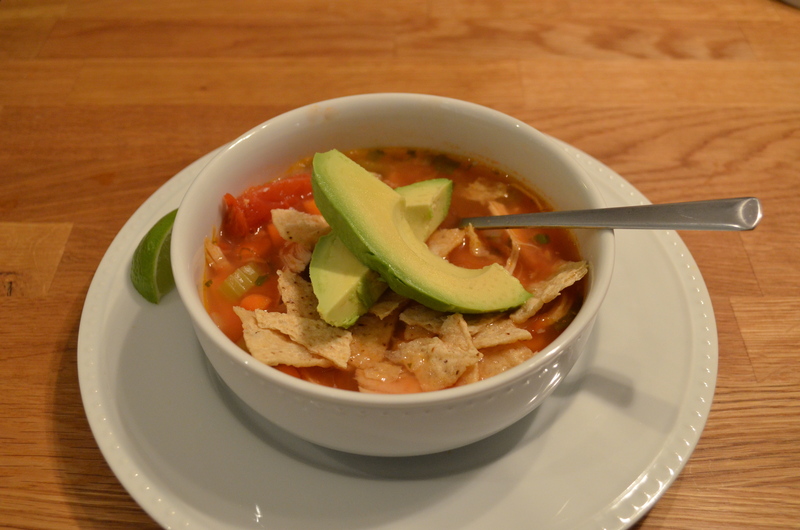 We garnished our soup with store-bought tortilla chips and fresh avocado and finished everything off with a squeeze of lime. The lime makes the soup. You can also top the soup with shredded cheddar or sour cream. Either way, don’t forget about the lime.